Well ... welcome (back) to my beer blog whoever is still around. Introducing beer no. 353 the Chouffe Houblon. My current favorite. A lot of hoppiness to it and at 9° not the lightest but a great beer by the Chouffe dwarfs. Anyway - we have been tasting some amazing beers but honestly I don't know when I'll get aorund to post some tasting notes. In the meantime though it's time for the Belgian Beer Weekend again. In principle we should make it there on one of the days as well ... Enjoy! Stella Artois recently started making cidre and when last in the UK I came across this fun commercial for the drink. Belgian Beers will eventually resume as we have tasted plenty. Belgium is one of those European countries best known for beer. The brews that come from the country are known for its superior overall quality and exquisite, world-class taste. Meanwhile, the United States is known to be a beer loving country that makes many unique brews. So what happens when an American brewer goes to Belgium to create Belgian-style beer? You get something like Stillwater A Saison Darkly. 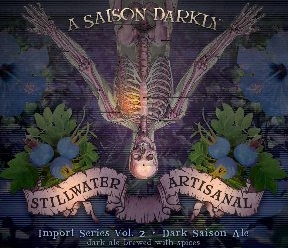 A Saison Darkly is part of the Stillwater Import Series. Stillwater Artisanal Ales is a brewery based in Baltimore, Maryland; its founder and brewer Brian Strumke visited Belgium to brew A Saison Darkly. Named in reference to the movie “A Scanner Darkly,” this beer may be criticized for not being a genuine Belgian brew. However, A Saison Darkly was brewed in Belgium, with the brewing equipment of Sint-Canarus. As the name suggests, A Saison Darkly is a dark saison but very different from a Belgian Saison. A saison from Belgium is often blond or amber in color, while this brew is colored dark black. The color of A Saison Darkly is attributed to the amount of burnt malts added in the beer. In a sense, this beer resembles an Imperial Stout more than a saison. When poured into a glass, one can see the great, creamy, long-lasting head. A Saison Darkly may be considered Belgian beer, but the flavors have been influenced by American craft brewing. It has the trademark citric hop flavors of many American beers. The taste has a tart, floral quality, thanks to the rose hips and hibiscus added in the brew. Upon tasting, one will find a pleasant fruitiness and the flavor of black berry juice may come to mind. The beer drinker may even detect a hint of chocolate in the brew. The taste concentrations are impressive, resulting in the dark, spicy and fruity 8% ABV A Saison Darkly. The beer is not the only thing worth raving about with A Saison Darkly. Even the packaging of this beer is unique. The label artwork is done by tattoo artist Lee Versoza. Try to get your hands on a bottle of this unqiue Belgian brew! Some things are seasonal. However, some seasonal things are so good, you still want to enjoy it after the season is over. This is the case for De Dolle Stille Nacht. I've saved a few bottles. If you can get your hands on one I'd highly recommend not waiting until next year. The Stille Nacht is a prestige beer from De Dolle Brouwers, an established Belgian brewery based in Eden. The Stille Nacht is considered a seasonal brew since it is brewed for Christmas. In fact, Stille Nacht means 'Silent Night' in English. It is already February, so people may be wondering 'why put the spotlight on a beer meant to be consumed on Christmas dinner?' Good beer is good beer, regardless of the season. The Stille Nacht may be Christmas beer, but who says you can’t have some on Valentine's Day? The De Dolle Stille Nacht is tawny; its color ranges from clear amber to dark orange. The appearance may remind one of barleywine. When poured on a glass, it reveals a big, fluffy and lasting off-white creamy head. The aroma and taste of this Christmas brew is also worth noting. The aroma of the Stille Nacht is a combination of sweet and spicy: one can distinguish a fruity smell, like that of strawberry, just as sharp notes and traces of leather and tobacco can also be detected. As for the taste, beer lovers who want something sweet will not be disappointed with the Stille Nacht. It is said that the beer is boiled for many hours, brewed with pale malt and white candy sugar in the kettle. This is probably the reason why the beer possesses such sweetness. The flavors to be tasted in the Stille Nacht include cocoa, caramel, pit fruits, plums and raisins. However, this beer is not just sweet. Nugget hops were added for bitterness to balance the sweetness. It has lots of carbon, and the big and sharp carbonation may be too much for some. It is malty with a dry and clean finish. The De Dolle Stille Nacht is a delicious, but strong beer. If you can find a bottle don't wait until Christmas 2012. Belgian Beer reviews coming up soon. That is 6 years of (Belgian beer) blogging. That is 350 Belgian beers tasted. That is 2011 - as in happy new year and here is to more beer. Christmas beers are making their appearance. Too early? Maybe. Too strong? Definitely! Did we miss them? For sure. The Saint Martin Noel, tasted in a dark and cozy bar in down town Brussels surrounded by tourists! Brewed by Brasserie de Brunehaut, the Saint Martin Cuvee de Noel is one of those beers that simply knocks you out without you realizing it. Let me explain: it is spicy, it is aromatic, it is also 8.5%! You don't have many of these. But it does taste nice. And the glass is a work of art. I do like white beers a lot. I find them refreshing and easy to drink. This one in particular is a winner. 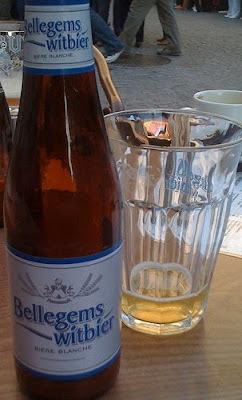 I really enjoyed the Bellegem Witbier, another beer brewed by Brasserie Bockor. At 5% more a summer beer - fresh with a hint of lemon. Another beer, this time an ancient/ traditional Flemish beer. It's a brown beer which mixes normal beer ingredients with lambic beer thus creating a distinct taste. Brewed by the Brasserie Bockor at 5.5% a drinkable, nice enough beer. 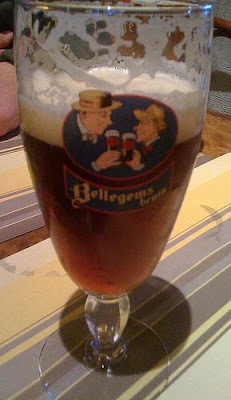 On the Belgian Beer blog also the Blauw by Bockor and a rant.